West 14th sits in the Oceana Beach Club at Palm Jumeirah, with huge windows that look out towards the Dubai Marina. The New York-style steakhouse, winner of What’s On 2013’s “Best Steakhouse and Grill in Dubai” award, is a contemporary restaurant focused on bringing the city’s Meatpacking District vibe to Dubai. Chef Clive Pereira helms the kitchen, using the experience and knowledge gained under Gary Rhodes’ tutelage to create an inspired menu. Whilst chatting with Chef Clive Pereira, I discovered that he is an incredibly humble guy despite his recent accomplishments. In the short time since being appointed as Head Chef at West 14th, he has already revamped the menu and managed to be named Gastronomic Superstar (superstar!) at the 2016 Leaders in Hospitality Awards (high five to Clive!). Starting off with a kitchen staff of 15 when he first joined West 14th almost a year ago, that number dropped to 5 over the Christmas and New Year holidays last year when it was decided that luxury hotel DUKES Dubai would be taking over the management of the restaurant from Mövenpick. But instead of breaking out into a cold sweat of panic, the chef remained calm and methodical as the calculated side of his personality took charge. It was about just cracking on (which, by the way, is what we embrace at The Caviar Spoon, so he’s just our kind of person). Although DUKES has yet to open, the chef knows that the discerning new guests will be anticipating a great atmosphere, great service, and amazing food based around the steakhouse concept. Besides that, the restaurant has a beachside terrace and is nestled next to the Oceana Residences, making it easy for residents to pop in after a dip in the pool or a stroll on the beach. Originally from Goa, Chef Clive was taken in under the wings of celebrity chef and restaurateur Gary Rhodes, who he credits for completely shaping his career in Dubai. 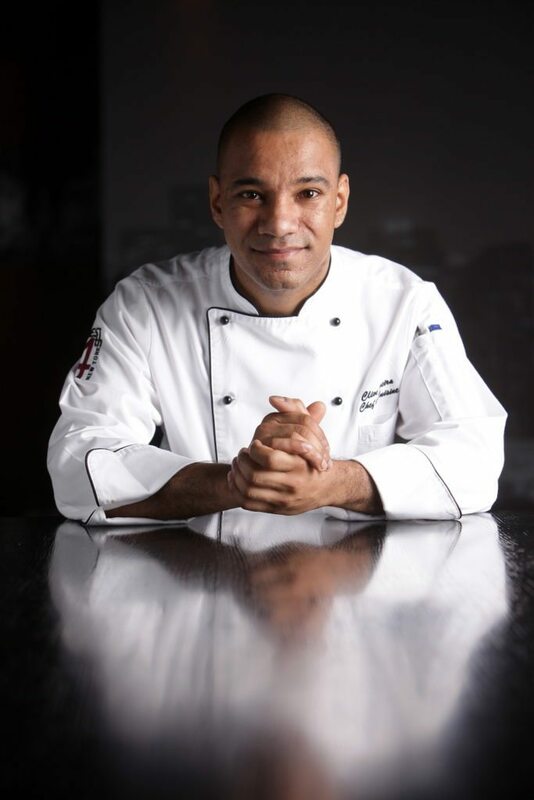 Over the course of 8 years or so, Chef Clive worked at his various restaurants, including Rhodes Mezzanine (now known at Rhodes W1) and Rhodes Twenty 10, whilst mastering the art of cooking under the great chef’s tutelage. Now, as the head chef of West 14th, Chef Clive is working his magic to create a menu that embodies the essence of New York’s Meatpacking District (which has W. 14th St. running right through it). From the sights and sounds to the nostalgia, the chef wants his customers to have a true dining experience. One of his rules in the kitchen is to keep things simple which, quite honestly, is probably easier said than done! But the one thing that really resonated with me after meeting Chef Clive is that he is a man of his word and that applies to this cooking rule. He focuses on the quality and sticks to the core roots—this is what makes up the DNA of the chef and his kitchen. As far as he’s concerned, a perfect dish will have, at most, 3-4 pieces on it and seasoning and accoutrements are kept to a minimum. He learned from Rhodes that usually a pinch of salt, a sprinkle of cayenne, or a squeeze of lemon juice will bring the dish to perfection; there’s no need to bombard the plate with too much, where everything is fighting with everything else. Chef Clive is also particular about suppliers and the consistency of products. Since West 14th is first and foremost a steakhouse, he makes sure to taste every piece of meat, even if it’s from the same supplier! He maintains good relationships with the suppliers and goes above and beyond when it comes to selecting them to ensure he’s getting the best ingredients. He’ll often visit the suppliers’ facilities to inspect what they have in stock and will also bring the suppliers into the restaurant to discuss what’s in season and how he can control costs, as well as to source what he needs for each menu on hand. At the time of this interview, the restaurant’s a la carte menu was in the process of being updated and Chef Clive was enthusiastic about a few dishes all based around the use of a well-sourced beef. In particular, one that he was hoping would make it onto the final menu was a slow cooked, smoked brisket with truffle mashed potatoes. And I have to say, having dined here a couple of weeks beforehand, I can honestly say that it was great food. He does what he says and says as he does. So what’s the secret behind creating menus that represent the brand and please the palate? The chef says the creativity stems from team discussions and looking at the produce that’s in season, and then coming up with ideas on how to best use them to create flavorsome and attractive dishes. Visually, he likes to rely on the seasons and Mother Nature to dictate the best colour and texture combinations. He notes the fantastic mangos in the kitchen at the moment, vibrant in colour and packed with incredible natural sweetness. It all goes back to keeping it simple and letting the ingredients do the talking. He believes that trends like molecular gastronomy are on their way out, which suits him just fine because the diners at West 14th are looking for simple, well-cooked, honest food. His staff are also encouraged to keep their creativity flowing by taking part in friendly competitions like ‘dish of the month’. Chef Clive finds that these kinds of engaging activities keep them motivated more than just shouting out orders. The restaurant also has a system that requires the waitstaff to spend time in the kitchen, which allows them to gain a better understanding of the kitchen operations and creates a solid relationship between the FOH and BOH. If you want to be on the chef’s team, you need to be, more than anything, positive and willing to learn. What does Chef Clive have in mind for the next 12 months? He says he’ll focus on promoting the food to residents and visitors alike. There are also various events that’ll keep him busy, from the winter outdoor movie nights to children’s cake decorating classes to the New Year’s Eve festivities, which will be a relaxed, open buffet affair. Last year was Hawaiian Night…I wonder what they have up their sleeves for this year?? Best meal in the UAE apart from yours? I enjoy eating at established places such as Gary Rhodes, The Ivy, and good steakhouses – the food service is always so consistent. I’ve never been yet but restaurants such as Noma, L’Enclume, The French Laundry, and Eleven Madison Park really inspire me as a chef and are definitely on my upcoming plans to visit. Now we just have to wait for the upcoming launch of DUKES. If DUKES London is any indication, we think this will be a pretty special place. In the meantime, drop into West 14th and enjoy yourself a delectable New York-style steak!